Hello fans, today I will be unveiling ways to find out the best charger and power cords for your electronic gadgets. So just follow me up as I teach you how to detect original power cords for your devices. After getting complaints from many followers of this blog, about them making mistake in choosing the best charger and power cords for their appliances/gadgets, I decided to make some research on how to put an end to wrong choice of charger power cords selection or fake power cable cord selections. So before going to get a power or charger cord for your appliances, is a must do to read this guide in order to avoid getting fake cables that can get your electronic devices burnt or damaged, thereby making you feel bad as you have wasted your hard earned money on fake product. Basic Battery maintenance tips for prolonging the lifespan of your device batteries. Expert Tips: Put an End To Your Android Phones Overheating likeOven Here. Going for three pin chargers can actually give you the best experience and original products, although two pin chargers may be so portable and flexible when looking for a space to plug it in an extension socket but most times doesn’t give the best you are looking forward to. Furthermore, the two pin chargers and power cords in talk, are actually electronic cables with just two connectors (the light and Neutral Pin). They have no earth connectors and as such regarded to have a negative effect on your electronic batteries. Because of ignorance most times we charge, we do use two pin chargers interchanging the light pin and that of the neutral pin connectors (Polarity interchange) of the 2 pin chargers. The thing is that, your charging will be working fine as expected but that causes depolarization (a cell defect), which reduces the lifespan of any device battery you are using. 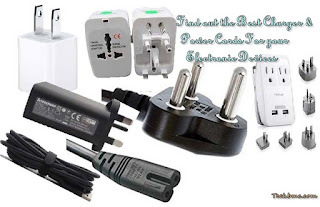 From above explanation about the polarity interchange that has to do with cell defect of your device when connected with two pin chargers, you would know that am fully recommending three pin chargers for your home appliances and gadgets. Because they are built with earth continuity connector, which protect the charger during thunder lighting and strike and as well doesn’t allow polarity interchange that causes battery defect on your electronics. Don’t Miss Out: Check if it’s Advisable to Use Mobile Phones& Tablets at Fuel Stations. Do you really understand that charges and power cords have their different power ratings for electronic gadgets? Well, this power rating in talk simply mean the electrical energy input the charger power cords actually consumes and the energy output it produces while plugged to a power source socket. It may interest you to know that "not every charger or power cords that powers your device matches the right specification". So don’t neglect to read the manual guide of the device you bought or own and most importantly, compare the power ratings of that your old burnt charger or power cord with the new charger you wish to get/buy for the device. To locate the full device specification, just check the body or back of the device and you will get the device connection specs. So to pin point the power rating of your device, it is always specified in Ampere-hour (Ah) unit. Don’t get confused by electronic marketers or dealers, as some of them may try to convince you when making a new selection of your burnt device charger, they will be like, power rating doesn’t matter when they don’t have the actual charger or power cord that brought you to their electronic shop. So ensure to always get a new charger that has the same power rating as that of original (follow come) charger your device had before. There are lots of disadvantages to fake or wrong charger and power cord selection when it comes to taking note of their power ratings. When the wrong selection is made considering the rate, it tends to supply excess or inadequate current or voltage to your devices, thereby causing a very bad reduction to their voltage and efficiency. So ensure to avoid totally. Considering cheap cost alternatives when getting a charger for your device is good and economical but ensure that you are not getting a fake charger for your device. As most times cheap things actually turns out to be fake items. And this is the reason why most people keep buying one particular thing always because they don’t go for original. If you are getting a cheap charger which turns out to be fake, it will keep burning, and you will keep buying new charger. In a month, you will buy up to 10 chargers just for one device, even spending more than the price of the original charger or power cords. It is funny but it’s true. So be wise and make a good choice of original battery chargers for your device so that it can last very long for you. Read Also: How to Detect Fake & Original Chargers Specificallyfor Android Users. >> Don’t over charge Batteries: Ensure to unplug your device charger from wall socket immediately the battery signaled fully charged, as overcharging reduces the battery life span. >> You should allow your device batteries to discharge completely before thinking of charging them back again; this is an authorized healthy practice for batteries. Also note that constant charging is never good for battery cells, so minimize the rate at which you constantly charge your batteries. >> The practice of using another different battery brand to power another device is absolutely prohibited for example: using Gionee battery to power a Samsung phone. Ensure to avoid for a better performance of the device branded battery. >> Replace or change your damaged batteries, don’t turn to become an overnight battery fixer. Change for better performance. That’s all on how to get the best charger and power cords for your electronic devices like (Mobile Android & iOS, iPhone, iPad phones, Plasma TVs, laptops/PC, Radios, Rechargeable lanterns, Home theatre, Fans, Pure Solar Sine Wave inverters, Refrigerators, Washing machines, printers, Air conditioners, Projectors, and other Home appliances. Ensure to comment and share the post friends. Thank you.